I cannot explain how incredibly frustrating it is..... and how hopeless you feel in the waiting moments to hear from mechanics/auto-electricians if it can be fixed..... or the dreaded bill..... when they haven't really solved the problem. Make an all-purpose cleaning spray!!!!!!!!!!! Cut up some lemons into wedges and put into a cleaned glass jar. Pour cleaning vinegar over the top of the lemons. White vinegar works too. Put the jars into a sink & cover with boiling water. Don't pour the water directly onto the jars in case they crack. Leave to sit until the water has completely cooled down (or overnight). Your all-purpose cleaner is done! It will keep for about a month. Now I can be a lean, mean, green cleaning machine! What!!! Lean - phef, I'm a woman I have round bits & I don't want to be mean! And after all lemons are yellow. Today is the last day for the pre-challenge tasks on the organised housewife challenge. Have you decided to join in? Have you done all the pre-challenge tasks? What are you most looking forward too? I hope you have your list of goals handy so you can refer to them to keep you motivated! What to do with all that Juice Pulp??? The juice pulp I used whilst taking these pictures was carrot, beetroot & silverbeet. You could use any type of pulp you want - if you are using fruit pulp you may not need as much agave to sweeten the cookies! The mixture will be moist but will hold together when pressed. Line a baking tray with baking paper. Roll tablespoons of the mixture into balls and lightly press down onto the tray. Bake at 180C for 20 minutes until lightly browned. Makes 10-12 cookies depending on the size of the balls. Optional: You could drizzle some icing over the top of these to give them a fancy look!!! My all time favourite vegetable to stuff is red capsicum! Its so sweet & delicious when its been roasted! I just LOVE it! If the vegetable is hollow, simply cut the top off & spoon out any seeds. If the vegetable is full - you need to scoop out the flesh (you can use it in the stuffing mixture). Mix the 'stuffing' in a big bowl. Spoon into the vegetables and bake until soft. - If the vegetable is very hard you may need to precook it a little to be able to scoop the flesh out! - I find a moderate oven works best, so that it doesn't burn the outside of the vegetable skin. - I recommend cooking time of 40-60 minutes depending on how 'hard' the vegetable is - note that precooked vegetables will take less time. And don't forget your herbs and spices! Its so much fun to experiment with different flavours and it can make the meal taste so different each time! Why not combine some classic flavours like Indian spiced-rice with coconut milk, or Italian herbs & lentils, or pizza-type vegetables with a tomato base. Pictured is a mix of carrots, spinach, brown rice & tomatoes with basil. I just feel like potatoes deserve a special mention of their own! Probably because I never 'stuff' potatoes in quite the same way that I do other vegetables! I always prebake them wrapped in foil & then cut them open to pile (and pile high) my fillings on. I usually opt not to precook my fillings for stuffing potatoes but rather use easy to chop and serve fillings such as baked beans, mashed avocado and several canned items - pineapple, corn etc. I also find that lots of leftover meals can be warmed and served on top of baked potatoes to re-create the meal is a whole new light! So good! The topping list is endless! Pictures is leftover lentils, capsicum, mushrooms, spring onion, corn & tahini. Simple stuffed potato - baked beans & mashed avocado! So delicious! Here's a nice quick meal that can be made in under 30minutes, from beginning to end - for those evenings when we're simply exhausted! Its also great for leftovers, can be warmed in the microwave or stove top. Sautee the onion & garlic in a large pot until the onion is soft. Add the sweet potato, silverbeet and chickpeas. Pour the stock & soy sauce over the vegetables, sprinkle the cumin on and add just enough water so that the mixture is not floating but so that the complete bottom of the pot has moisture. I found this was about 1/2 cup. Put a lid on and simmer the mixture for 15 minutes until the silverbeet is cooked through & the sweet potato is soft. The stock should thicken and a little bit remaining in the bottom but not so much that the mixture is soggy. Spoon into bowls & top with a spoonful of tahini. Optional: Serve over brown rice or noodles. 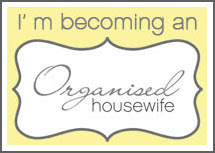 I'm becoming an organised housewife!!! I've been really motivated to clean & tidy the last few months. Have you read my post about how I've switched to chemical free cleaning? It's so refreshing to have things organised, clean & tidy. A life long dream of mine after renting for over 10 years. However, moving is never fun, no matter when or where you end up and I must admit that there were several places in our home that didn't quite get the unpacking attention they deserved, especially as our unpacking was somewhat crowded by the Christmas time rush. I have been very motivated to get EVERYTHING all sorted out properly & when I stumbled across this the other day I was HUGELY excited! 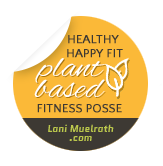 And the best news is that you can too! 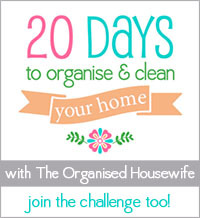 The amazing website The Organised Housewife has put together a challenge called 20-days-to-organise-and-clean-your-home. Why not sign up to the fun & join hundreds of other ladies as we seek to clean & organise our homes! There was a time when my home was in a complete ~SHAMOZZLE~ to say the least, with little time or energy to fix it even though I so desperately wanted to! I must admit I am so pleased with how our home is today. Yes it takes a bit of time, but it never hurt me to turn off the TV or close down that facebook page! In fact, in made me feel SOOOO good if I did! After all - a home is supposed to be somewhere that we can relax & feel comfortable & enjoy being. I LOVE COMING HOME TO OUR HOME. Every woman needs an organised dresser! Sure beats the pile of tissues and make-up and pens and pins it used to have on it! How can it be that having an organised under-the-sink can feel so good? Especially when its arranged alphabetically!!! But for now.... it's bed time! I'm going to continue to post about my journey through the challenge with more pictures to come! Another great vegan pizza - this time without any 'cheese'. Mash a can of borlotti beans with 150g salsa. Spread over a pizza base as you would pizza sauce. Top with mushroom slices & corn. Put your pizza in the oven. While you're pizza is cooking, make the avocado dip. Combine the flesh of one ripe avocado with a 1/4 teaspoon minced garlic, 1/4 teaspoon chilli and a 1/4 teaspoon lime juice. Mash well. Drop spoonfuls of the avocado dip onto the pizza! MIL!!!! What's MIL you ask? My mother in law makes the most amazing soup! And she always tells me how easy it is! I have used her as inspiration for this simple and yet very tasty soup! Cut all the vegetables into bite size pieces. Peel if desired. Put the vegetables and tomatoes into a large saucepan. Rinse the tomato tin out to get all the juice - use 2 cups worth of water to do this. Add the vegetable stock. Bring to the boil, cover & simmer for one hour. Add the drained red kidney beans & continue to cook for a further 15 minutes until beans are warmed through. Stir in the oregano. Delicious by itself or served with warm crusty bread. Pour 1/2-2/3 mixtures into a lined rectangular baking pan. Scatter raisins over the mixture. Top with orange juice pulp (as much or little as you desire - I used about 1 cup). Pour the rest of the cake mixture over the top and spread over the cake til the pulp is completely covered. Bake in a preheated 180C oven for 30 minutes or until a skewer inserted into the middle comes out clean. Allow to cool before slicing. For best results use a serrated knife. I just love how the layer is visible! I had to take so many pictures!!! Delicious plain, however if you'd like to add an 'icing' - I recommend blending almonds & orange juice together and spreading over the top. - Don't have a juicer - you could always use grated carrots in place of the orange juice pulp, or alter the flavour by using other pulp. - Orange flower water can be found in MiddleEastern-type shops - alternatively just use 2 Tablespoons orange juice. And would you believe that is still tastes soooooo good!!! Grind the flax seeds and combine with the oats and raisins. Core the apples & grate them into the dry ingredients. Add the remaining ingredients and combine well. Pour into a lined 25cm square baking dish and press mixture down well. Bake at 160C for one hour until lightly golden brown on top. Cool in the tin - then remove and cut into bite size squares with a serrated knife. Who said vegans can't have great pizza? I used a wholemeal pizza base & put a mixture of BBQ and sweet chilli sauce on the base. Topped with a huge handful of baby spinach leaves, roasted eggplant, chopped button mushrooms, spring onion and green capsicum - and of course.... topped with my pizza cheeze sauce. I did however use cannellini beans in place of the chick peas in the recipe. I still love a good no-cheese pizza every now and then also - a pizza place down the road from us does an AWESOME pizza too. 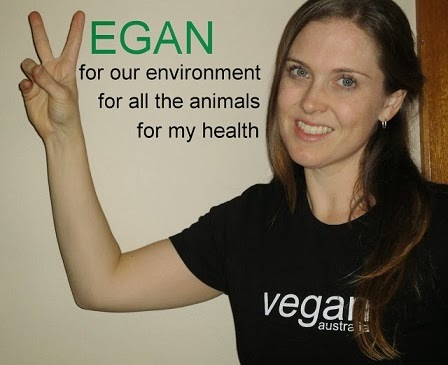 I stumbled across this the other day - for some great vegan pizza ideas check out this Website.